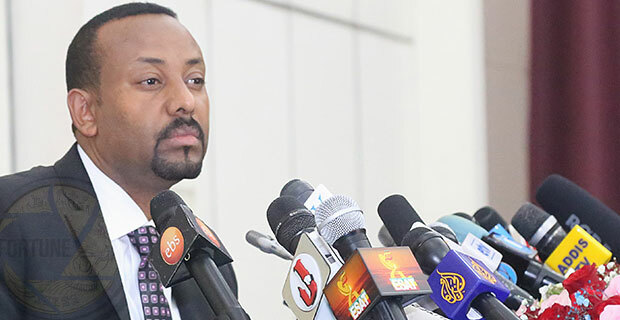 During his first press conference held since assuming power nearly five months ago, Prime Minister Abiy Ahmed (PhD) told local and foreign media on Saturday that the World Bank would provide one billion dollars in direct budgetary assistance to Ethiopia. “The money will be disbursed in the next few months,” Abiy told the nearly 120 journalists that gathered in his office for the briefing. The announcement was made just a month after Abiy met Jim Young Kim, president of the World Bank in Washington D.C during his trip to the United States. At their meeting, the Bank’s chief told the Prime Minister that his institution is ready to provide “robust support” for his administration. “World Bank is ready to help realise his vision of boosting human capital and to end poverty in Ethiopia,” Jim Young tweeted after his meeting with Abiy. “For the past many years, World Bank didn’t directly support the country’s budget,” said Abiy. For the new fiscal year, the country has allocated a 12.6 billion dollar budget, which is 5.3pc lower than the previous fiscal budget. The budget assigns 4.1 billion dollars for capital expenditure, 3.3 billion dollars for recurrent spending and 4.8 billion dollars for subsidiary appropriations to regional states. The remaining 216 million dollars is allocated for Sustainable Development Goals projects. The government’s budget includes 1.89 billion dollars from external aid and grants. For 2018, the World Bank has pledged 3.3 billion dollars to Ethiopia, which is over three times higher than the Bank’s commitment in the previous fiscal year. The World Bank’s lending to Ethiopia in 2017 was 956 million dollars, the lowest in five years. World Bank’s Country Partnership Framework for Ethiopia, outlined for the coming five years, is designed to support the second edition of the Growth & Transformation Plan (GTP II) and to support the Bank’s twin goals of eliminating extreme poverty and boosting shared prosperity and objectives outlined in the Sustainable Development Goals. “World Bank’s pledge means the country is now stable and inclusive,” Abiy said. In addition, the country faces large external imbalances, foreign exchange shortages, rising external debt and inflation, which are major contributors to the disruption of the macroeconomic situation of the country. “The structural problems in the economy have not been addressed yet,” he said. He believes that the Bank is going to pledge the money as they are developing trust in Ethiopia following the recent period of peace and stability. “Following the new rapprochement with Eritrea, many countries and development partners are showing interest to support the country financially,” Abiy told journalists. Abiy seems optimistic on the macroeconomic situation of the country, which he believes is getting better. However, a macroeconomist with three decades of experience sees the rationale of the finance from a different perspective. According to the macroeconomist, who spoke on the condition of anonymity, the Bank is rewarding the government’s recent bold moves to partially privatise the big four state-owned enterprises, as well as for the devaluation of the Birr. In June, the ruling party announced its plans to partially privatise Ethiopian Airlines, Ethiopian Electric Power, and the Ethiopian Shipping & Logistics Services Enterprise. Last October, the National Bank of Ethiopia devalued the Birr by 15pc against a basket of major currencies. The Bank along with international financial institutions have been recommending that the country devalue its currency, privatise and liberalise state-owned enterprises and undertake major economic reforms. “The current finance seems as a bonus for these moves,” he said. During the past fiscal year, Ethiopia sourced close to 555.4 million dollars of foreign aid and grants. The country also received 43.2 million dollars to implement various programs, which was 41pc higher than two years ago. The economist believes that the grant will not independently cure the economy but will instead offer temporary relief. “For a country with a trade deficit of 16 billion dollars, addressing macroeconomics in conjunction with major economic reforms is very essential,” he said. Comprehensive, brazen and audacious reforms pushing privatisation hard, revamp foreign exchange rate management, transform the agricultural sector, reform the trade and land policy and review constitutional issues that create bottlenecks should be addressed, according to him. Last year, following the economic reform program of Abdel Fattah el-Sisi, Egypt’s president, the World Bank approved 1.15 billion dollars to the country. Still, the macroeconomist argues that the Bank’s commitment is strange and needs clarification from the Prime Minister. He said that the bank’s financing usually goes toward projects. The World Bank’s major intervention areas in Ethiopia for the past few years were basic education, access to markets and job opportunities for youth. It has also been helping the country to build resilience and inclusiveness in gender equality by improving safety nets, investing in productive landscapes and focusing on the Early Years agenda. “The Prime Minister has to present it to the Parliament for deliberation,” the expert said.